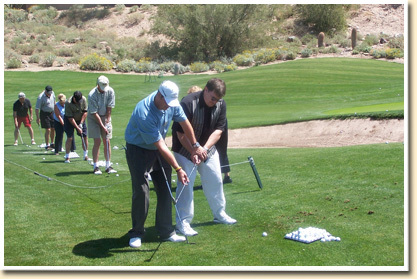 The Eagle Mountain Golf Academy is the premier golf school destination in Arizona. Located at Eagle Mountain Golf Club, the #1 ranked public course in Arizona in 2006 and 2007, the Academy is the perfect place to shave strokes off your game. The combination of an outstanding golf course, practice facility, and custom golf school packages make our Academy one of the most popular in Arizona. Widely regarded as one of the region's top instructors, Director of Instruction, Derek Nannen is dedicated to making the game more enjoyable for players of all abilities! 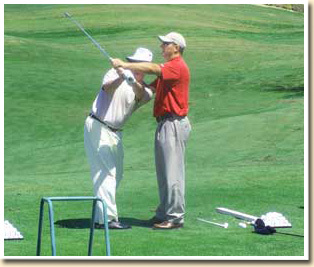 His experiences on the PGA TOUR, Nationwide Tour combined with his extensive knowledge of the golf swing will make your private lessons or Golf School packages both educational and fun for all! "The school was incredible.....my handicap has improved 8 shots and I am now shooting in the 80's evertime I go play.....thanks for all your help Derek...."
"I learned more in 3 days than I have learned in the 20 years of playing golf. This was exactly what I was looking forward. The attention to detail your staff had was unbelievable."